Stephen Hawking (1942 – 2018) is an English theoretical physicist, cosmologist and author. He is best known for his attempts to explain in clear terms the origins of the universe and some of the most complicated aspects of the cosmos and physics. Hawking was the first scientist to offer a theory of cosmology explained by a union of the general theory of relativity and quantum mechanics. Stephen William Hawking was born on 8 January 1942 in Oxford, England. His family had moved to Oxford to escape the threat of V2 rockets over London. As a child, he showed prodigious talent and unorthodox study methods. On leaving school, he got a place at University College, Oxford University where he studied Physics. 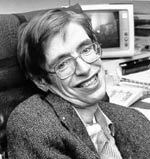 His physics tutor at Oxford, Robert Berman, later said that Stephen Hawking was an extraordinary student. He used few books and made no notes, but could work out theorems and solutions in a way other students couldn’t. On gaining a B.A.Hons in Physics, he briefly stayed to study astronomy but was not interested in observing sunspots so moved to Trinity College, Cambridge where he was able to pursue his passion for theoretical astronomy and cosmology. It was in Cambridge that Stephen Hawking first started to develop symptoms of neuro-muscular problems – a type of motor neuron disease. This quickly started to hamper his physical movements. His speech became slurred, and he became unable to even to feed himself. At one stage, the doctors gave him a lifespan of three years. However, the progress of the disease slowed down, and he has managed to overcome his severe disability to continue his research and active public engagements. At Cambridge, a fellow scientist developed a synthetic speech device which enabled him to speak by using a touchpad. This early synthetic speech sound has become the ‘voice’ of Stephen Hawking, and as a result, he has kept the original sound of this early model – despite technological advancements. 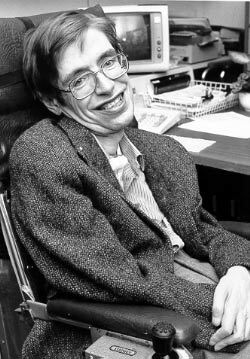 Stephen Hawking’s principal fields of research have been involved in theoretical cosmology and quantum gravity. Amongst many other achievements, he developed a mathematical model for Albert Einstein’s General Theory of Relativity. He has also undertaken a lot of work on the nature of the Universe, The Big Bang and Black Holes. Stephen Hawking has become one of the most famous scientists of his generation. He makes frequent public engagements and his portrayed himself in popular media culture from programmes, such as The Simpsons to Star Trek. 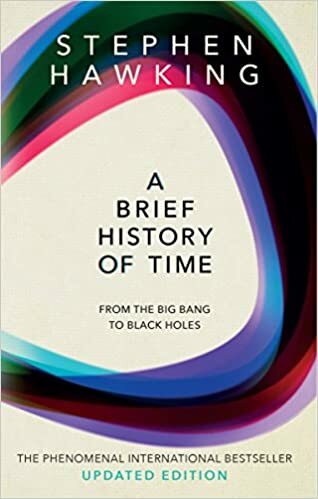 Hawking had the capacity to relate the most complex physics to relateable incidents in everyday life. Stephen Hawking. 7 January 2016 – Reith lecture at the Royal Institute in London. He married Jane Wilde, a language student in 1965. He said this was a real turning point for him at a time when he was fatalistic because of his illness. They later divorced but had three children. Stephen Hawking passed away on 14 March 2018 at his home in Cambridge. Citation: Pettinger, Tejvan. “Biography of Stephen Hawking”, Oxford, UK – www.biographyonline.net. Last updated 15 January 2018.